We recently discovered the Cinestudio D’Or on Almirante Cardoso 31 (location). 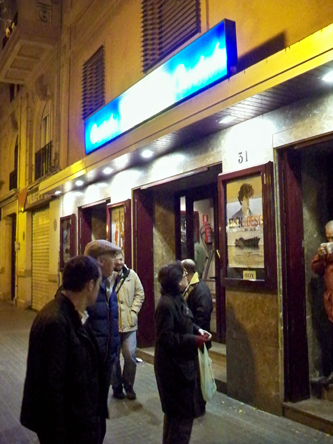 A well-known Valencian institution, the cinema is fabulous… in a messy, anarchic sort of way. Every week, two second-run films are shown at the highly reduced price of €3 weekdays, €4 weekends. Tuesday is always reduced, at €2,50. But the trick is that one ticket will let you see both shows. It makes for a long evening, but that’s why everyone brings bags full of food and drink. At Cinestudio D’Or, they just don’t care. There are no concessions at the studio, so go ahead and pack up greasy bocadillos and liter beers! Everyone else will have done it, and you’ll feel like a chump if you show up with nothing to eat. The hall is extremely long and oddly shaped — the floor tilts slightly upward from about row 30 onward, which is a weirdly pleasant way to watch movies. We’ve gone a few times and enjoy it. The cinema is popular, especially on Tuesday night, and while the noise of people eating can be distracting, it somehow adds to the charm. Check out their website for the films of the week. Everything is in Spanish, without subtitles.